Before the Detroit Red Wings reeled off two straight wins against the Washington Capitals and Pittsburgh Penguins this weekend, things had been gloomy for Hockeytown. The prospect of missing the playoffs is something an entire generation of Red Wings has yet to experience. With little to be thankful for, The Hockey Writers’ Grind Line column for this week is focused on past teams that tore up the NHL. Why not reminisce on the good times? So for this edition of The Grind Line, the Red Wings’ coverage team shared their thoughts on which Hockeytown team was the best ever. Be sure to voice your pick in the comments section below. Nothing against the latest Red Wings dynasty, but the 1951-52 squad was the greatest in franchise history. You can also thank them – and the Cusimano brothers – for Hockeytown’s octopus tradition. During the 1951-52 season, the Red Wings were firing on all cylinders. Legends Gordie Howe, Ted Lindsay, Sid Abel, Red Kelly, Alex Delvecchio, and Terry Sawchuk led Detroit to a 44-14-12 record and a perfect postseason. Not only did Detroit’s stars deliver, but they were also flanked by lesser-known (today) Metro Prystai, Marty Pavelich, Glen Skov, Johnny Wilson, and a young Marcel Pronovost. The team scored an impressive 215 goals in 70 regular season games – 20 more than “Rocket” Richard’s second-place Montreal Canadiens. 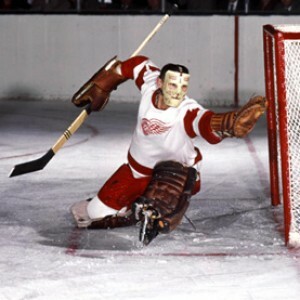 On an even more impressive note, Terry Sawchuk only allowed 133 goals for the Red Wings – 24 fewer than the Toronto Maple Leafs. The netminder was otherworldly that year, registering 12 shutouts during the during season. In 100 Things Red Wings Fans Should Know & Do Before They Die, Bob Duff noted that the ’51-’52 Red Wings didn’t lose back-to-back games all season. On that topic, Marty Pavelich was quoted on how much that team hated to lose. “I used to feel sorry for the teams we played the night after we’d lost, because we’d just kick the hell out of them.” Three times they followed up a loss with a 6-1 victory the next night. While those Red Wings were certainly talented, Delvecchio and Howe had their own theory for why the team won so much: they got along. They frequently hung out outside of the locker room and even formed their own bowling league. When the playoffs rolled around, the Red Wings could not be stopped – literally. Detroit won all eight of its postseason games and did not allow a goal on home ice. Sawchuk’s 0.62 GAA plus Howe, Lindsay, and Prystai’s seven points apiece helped the Red Wings capture their fifth Stanley Cup in franchise history. To me, the 1951-52 Red Wings were the best team to ever compete in Hockeytown. To say the 2001-02 Red Wings team was stacked is an understatement. The team possessed nine future Hall of Famers (Brendan Shanahan, Sergei Fedorov, Brett Hull, Nicklas Lidstrom, Luc Robitaille, Steve Yzerman, Igor Larionov, Chris Chelios and Dominik Hasek) and most likely will have one more Hall of Famer in Pavel Datsyuk. Don’t forget, they also had a Hall of Fame coach in Scotty Bowman. 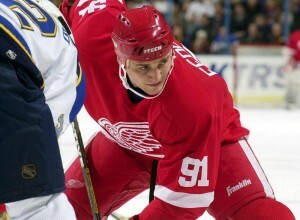 General manager Ken Holland was busy during the summer of 2001, trading for Hasek and signing Hull and Robitaille. In an era with no salary cap, Holland took full advantage in an attempt for his second Stanley Cup as general manager. The Red Wings easily grabbed the Presidents’ Trophy with the league’s best record (51-17-10-4), 15 points ahead of the second-place Boston Bruins, and had the best goal differential (plus-64), with the San Jose Sharks in second place at plus-49. Not only did the Red Wings have Hasek, who accounted for 41 of the team’s wins, but backup Manny Legace was solid, posting a .911 save percentage, one shutout and 10 wins in 20 games played. Hasek had a .915 save percentage and five shutouts. Unfortunately, advanced stats were not tracked during the 01-02 season, but I imagine the Red Wings’ shot-attempts-for percentage would be close to 55 percent. The Red Wings averaged 31.0 shots per game, second behind Boston (31.7), and allowed 26.3, which was 13th. However, they had the most wins when outshooting opponents (35), according to NHL.com. They also outshot their opponents in 61 percent of their games (50 of 82) and managed 15 wins even when being outshot by their opponent. They didn’t exactly cruise in the Stanley Cup Final: The Red Wings had to overcome a 2-0 deficit to the Vancouver Canucks in the conference quarterfinals and a 3-2 deficit to the Colorado Avalanche in the Conference Final, but they easily handled the St. Louis Blues 4-1 in the conference semifinals and beat the Carolina Hurricanes 4-1 to win the franchise’s 10th Stanley Cup and third in seven seasons. Lidstrom won the Conn Smythe Trophy, becoming the eighth defenseman to win the playoff MVP honor, and he also won his second Norris Trophy as the league’s best defenseman. Which Detroit Red Wings team was the best in franchise history? Comment below with your pick.